Architects: Arthur H. Sharp, landscape gardening student, Class of 1910. An elegant, but unobtrusive structure, the station had a low hipped roof with extended, bracketed eaves which evoke elements of Craftsman style and Italianate architecture. Cars and buses supplanted the trolley lines by the mid-1930s and the last rails were pulled up in the 1950s. The station itself was to be removed in 1994, when a passing faculty member noticed and stopped the destruction. It stands next to its modern replacement, a Plexiglas and metal bus stop. 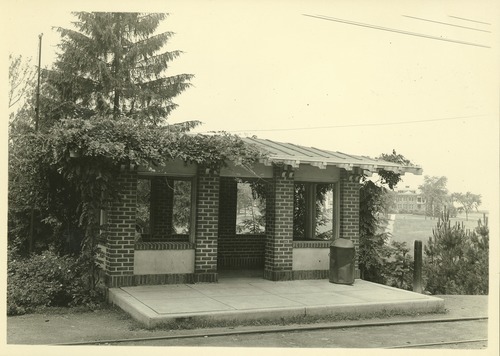 The Waiting Station Shelter was a one-story brick and cement Craftsman structure with a shallow-pitch hip roof that has roof brackets and is covered with asphalt shingles. The structure is an enclosed rectangular pavilion that is three bays wide and two bays deep, comprised of eight brick piers along the perimeter of the building. The perimeter wall between the brick piers consists of modern single-pane plastic windows above cement panel kneewalls. The windows have 5/4 applied grids. The sole entry, which is open and has no door, is located in the center of the three-bay east elevation, facing North Pleasant Street. An illustrated postcard of the early 20th century indicates that the Waiting Station Shelter once had exposed rafter tails and 3/1 sash, or 3/1 fixed windows, above the cement panel kneewalls. These features no longer exist. According to Joseph S. Larson, Professor Emeritus in the Department of Natural Resources Conservation, the former UMass Landscape Architect William Lambert considered the building to have been designed to be evocative of Japanese structures, in recognition of the Massachusetts Agricultural College’s longstanding connection to the Imperial College of Agriculture in Sapporo. This connection had been forged by MAC President William S. Clark in the 1870s. As late as the 1950s, the Waiting Station Shelter’s roof had an overhang extension, or sun shade device, in the form of several rails that ran parallel with the edge of the roof. When the overhang and other decorative details were removed as part of a building renovation during or after the 1950s, Mr. Lambert is believed to have salvaged a portion of the overhang in the hope that it might someday be reconstructed. It is unknown whether this salvaged section still exists. At the time of its demolition, the Waiting Station Shelter was a stylistic anomaly when compared to other nearby buildings on the campus. Originally built at some distance from the rest of the campus buildings because of its function as a transportation center on the trolley line, the 1911 Craftsman building was surrounded on its north and east by University structures of much more recent dates and styles, specifically the Hasbrouck Lab built in 1948 (with an annex of 1962-64) and the Morrill Science Center built in 1958 (with additions of the 1960s onwards). The Waiting Station Shelter is located to the north of the intersection of the cross-campus walk and North Pleasant Street. The shelter is set in an area of bituminous concrete immediately to the west of the street. To the west of the shelter, a bituminous concrete walk leads to the Lincoln Campus Center and the cross-campus walk leads along the northern edge of the Campus Pond. Acorn-style pole lights border the walks. Vegetation to the west of the shelter consists of White Pine planted over lawn. A contemporary bus shelter is located along North Pleasant Street to the north of the Waiting Station Shelter. 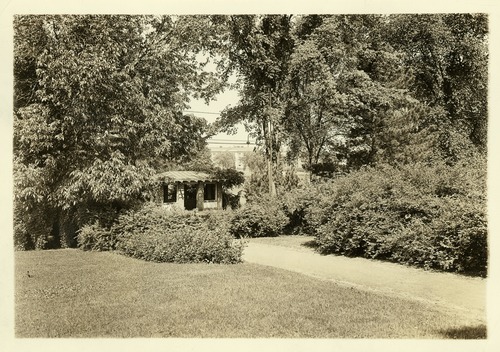 The Waiting Station Shelter, which now serves as a bus shelter for the University of Massachusetts, was constructed in 1911 as a station and shelter for passengers of the electric railroad trolley line that ran along North Pleasant Street through the grounds of what was then the Massachusetts Agricultural College. This trolley line, known as the Amherst and Sunderland Street Railway, had been built in 1897 to provide a direct line of communication between those communities and Northampton, and the line was extended to South Hadley in July 1902. According to Walker in 1903, the recent extension of the trolley line through the Holyoke Mountains immediately sparked tourism in the region, with visitors from “New York, New Haven and other distant cities” traveling to the area to see its wild and unique scenery. Walker credits the trolley with making Amherst, already established as an educational center in 1903, into a place of arrival for visitors who came to enjoy the area’s rich historic associations. Walker’s itinerary of the trolley line includes a chapter on the attractions of the University’s picturesque landscape, buildings, and student activities such as football games or marching battalions, all of which she indicates may be seen from the trolley car. In the early 20th century, before mass ownership of automobiles, the Amherst and Sunderland Street Railway was an important transportation mode for the Massachusetts Agricultural College, and the choice of site and design of the Waiting Station Shelter reflects the importance of this structure’s role in 1911 as the gateway building to the College for the public who had traveled there by way of train and trolley. The Waiting Station Shelter’s location on a prominent site above the campus’s centerpiece Pond would have been highly visible on the campus in 1911. The building’s design in Craftsman style was both modern and progressive for the period. Trolley line companies went into decline in the 1920s and many eventually went out of business, as a result of automobile ownership becoming more affordable and widespread in the United States. The Massachusetts State College campus map of 1931 still labels the Waiting Station at the center of the map and features the trolley tracks on North Pleasant Street. However, by 1935, the campus map no longer shows the trolley tracks, although the Waiting Station remains on the map as a numbered building. By 1959, the campus map neither lists the Waiting Station Shelter nor shows the building’s footprint. In 2012 the shelter was demolished during the construction of the new Academic Classroom Building. The Waiting Station Shelter (1911) was located at what was the intersection of North Pleasant Street, the cross-campus walk, and the walk that connected the intersection to Draper Dining Hall (no longer extant). The building first appears on a 1919 campus plan. To the west (rear) of the shelter, deciduous shrubs bordered the cross-campus walk and vines grew on the roof of the structure. The vines on the façade of the structure are no longer extant and new White Pine has been planted to replace the missing evergreen vegetation, although the present planting does not match the historic layout. Historically, the Waiting Station Shelter was shaded by street trees that once lined North Pleasant Street (no longer extant) and evergreen trees once bordered the north side of the cross-campus walk (no longer extant). In general, vegetation has changed dramatically in the vicinity of the Waiting Station Shelter, which now stands at the edge of North Pleasant Street, isolated in bituminous concrete pavement. Topography surrounding the Waiting Station Shelter changed as well. The change in topography to the west is less steep than it was historically.